Genlite has their genset manufacturing plant registered as a Small and Medium Enterprise (SME) Unit at F-63, SIPCOT Industrial Park, Irungattukottai, Sriperumbudur Taluk, Kancheepuram - 602117. The silent diesel gensets manufactured by Genlite are in technical collaboration with Kirloskar Oil Engines Limited, Pune, being their Authorized Genset Original Equipment Manufacturer (AGOEM). These silent gensets conform to the Government of India notification issued by the Environment Ministry for noise limits in January 2008. The main factory at Irungattukottai has a total covered area of 43,500 sq.ft. including two factory sheds, three truss areas, office building, EB room, toilets, etc. The total work force, including contract labour, is around 250. The DG sets manufactured by Genlite are type tested every year by ARAI Pune, Nodal Agency appointed by Central Pollution Control Board. Presently the unit has the capacity to manufacture upto 500 Nos. of DG sets a month. 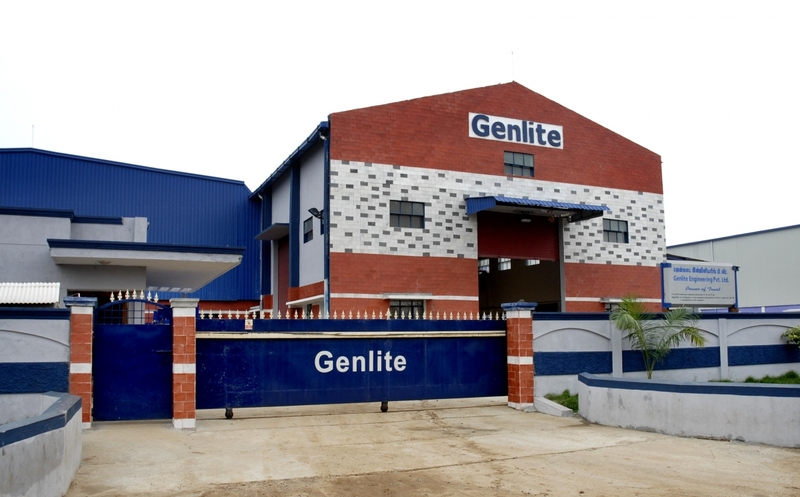 Genlite has also rented a warehouse near its main plant in Irungattukottai, to cater to the KOEL supplied full DG sets receipt, storage, testing and dispatch requirements, as well as storage of finished canopies and other raw materials from time to time. The new facility is 20,000 sq.ft. in area with a total covered area of 6,500 sq.ft and 13,500 sq.ft. of open space approximately. Genlite has another rented production unit at Puthencruz near Kochi, for assembling of Diesel Generating sets and acoustic enclosures only. It has 7,500 sq.ft. covered area approximately for production activities and can produce about 200 Nos. of DG sets per month. Genlite has imported CNC machines like Press Brakes, Shearing machine, Turret Punch for cutting, bending, folding etc. Also there are welding machines, overhead cranes, trolleys and other equipments. For these manufacturing activities the main raw materials are Diesel Engines, AC generators, CRCA / HR sheets, Fiber glass wool / foam, Aluminium perforated sheets and other consumables. The acoustic enclosures suitable for gensets confirming to the noise regulations are manufactured using CRCA / HR steel sheets, fiber glass wool, acoustic foam supported with Aluminium perforated sheets. The diesel gensets are assembled by coupling the engine and alternator on high-precision fixtures and seated on a formed base frame and housed inside the acoustic enclosures. Suitable fuel tanks, control panels, starting batteries with leads are also fitted inside the enclosures to make complete ready to use acoustic gensets. The gensets thus made are tested for noise level as well as for the load capacity. These tested gensets are dispatched to the customer’s sites and installed as per recommended site conditions.